In 1970 the doors of Mary’s Boon were opened by Mary Pomeroy and five young staff members from Nevis. Forty-Three years later wonderful years later the family owned and operated Management the famous five remain at your service. The management has just this year set about refurbishing the room accommodations and upgrading the restaurant, whilst at the same time keeping to the traditions introduced by Mary many years ago. Offering thirty seven comfortably furnished and imaginatively decorated rooms, all with modern conveniences, such as Plasma T.V, Satellite service just to mention a few, and only steps away from the lapping ocean, Mary’s Boon Beach Resort is truly unique to St Maarten. Tucked away in quiet seclusion, Mary’s Boon is conveniently located on Simpson Bay Beach, just south of Princess Juliana Airport and only minutes away from shops, restaurants, casinos, night clubs and more. This year-round resort offers Beachfront and Garden Studios and Suites with air conditioning, Cable TV, telephones, and kitchenettes. We, at The Boon, constantly strive to improve our property and have recently added new steps down to the beach from The Bar and dining room for greater beach accessibility, a dining Cabana on the beach, and a gift shop. A wine cellar, new spa service and much more are being introduced. At the heart of the property lies the main house where you will find our newly renovated lobby and The Tides Restaurant and Bar. 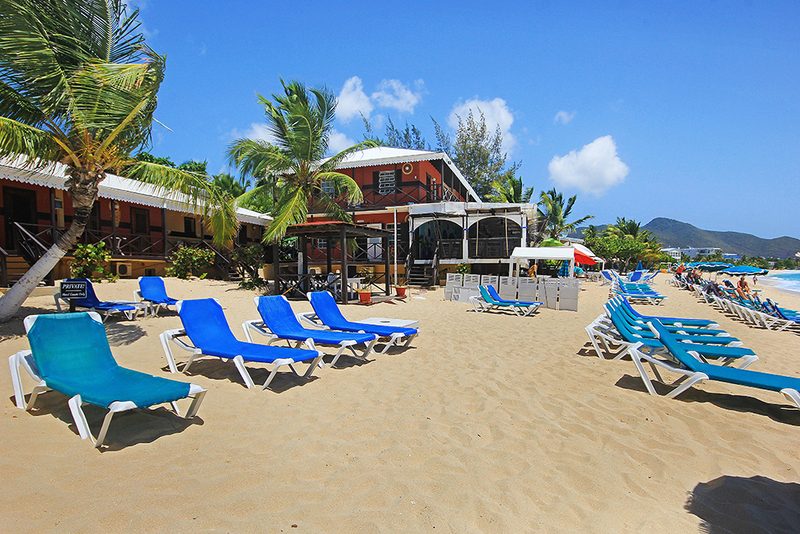 The bar has a bartender in the afternoons and evenings and come for lunch on the beach and lots of fun during the days. Our dining room and beach cabana are the most romantic locations and provide the only beach dining in St Maarten. During the day we are open for breakfast and lunch. We offer casual à la Carte choices, with Jeanette cooking up the daily specials, and beach or poolside service. In the evening chefs work their magic in the kitchen, offering nightly specials and feature dishes. View our menu on this site and call for a reservation. St. Maarten hotels on the island, Mary’s Boon is the only one that has been selected as an award winning hotel by Conde Nast Travel. Browse our web site to find out more and feel free to contact us if you require more information. We’re sure you’ll be impressed by one of the finest St. Maarten hotels on the island. We hope to hear from you soon. The hotel has enjoyed nominations by Condé Nast Traveler in 2003 and 2005, and good reviews in the Boston Herald and New York Times, as well as being featured in Travel and Leisure, Frommer’s Caribbean, and in the Toronto Star in 2007. Also, Mary’s Boon was nominated Best Guest House in 2010 and Best Resort in 2014 by the Daily Herald. The toll free number is 1-800-497-5834 or Main USA line is 305-432-5432. .